Recently two of my games were discussed in great detail on a new podcast by Chris Norwood called Exploring Games. You should give it a listen! I've got a new logo! duBarry Games will now become Phantasio Games. Phantasio means "to imagine" in Latin. My future releases with Game Salute will feature this logo. Can you help me think of a good tag line for my new name? Thanks for your patience as we continue to tweak the site and complete the transition! I mentioned previously that I purchased Hawaii, by Greg Daigle, at Origins (my only game purchase there). Since then, Isabel and I have played three times. Until today she had reigned supreme, nudging me out in the first and blowing me away in the second. Today was different--final score, Isabel - 100 and Philip - 149. So how is the game? Really fun! The basic idea is that you have ten areas on the main island and a number of available activities on the beach. Your job as chief of a neighboring island is to establish villages and build them up (and create nice scoring combos in the process). This game only has three resources: shells (to buy stuff), feet (to move and paddle a boat) and fruit (to stand in for either shells of feet). The game lasts only five rounds, so you definitely feel pressured to get a lot done quickly. Another source of pressure is a target spending goal each round (which gets higher as you go). You have to spend X shells (or, specifically, claim that value in price tokens) to get a significant scoring boost at the end of each round. Thursday had been a good beginning. Friday morning, I awoke refreshed and ready for the day. First up, a roll of the Lucky Dice (score=80, putting me on the leader board for nearly half the day) at the Dice Hate Me booth (see his pictures here). I spent the morning running a demo of my soon-to-be-Kickstarted Family Vacation from Jolly Roger Games. Jacob Walker, the artist, was at the booth and had brought a shiny new version of the board. I took this to the Board Room and quickly found five willing players. The game went extremely well--everyone had a great time! After lunch, I ran another demo of Family Vacation with an actual family (boy, girl and mom). They really got into the spirit of the thing--the boy made some very humorous comments about his "mom" during the game. 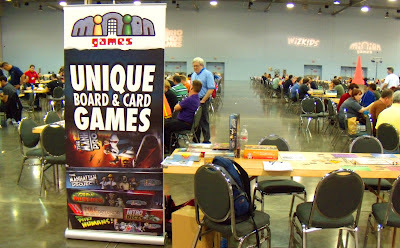 I've been so busy with post-Origins stuff that I almost forgot to blog about it. Wow, Origins 2012. What an amazing experience! I set out early Thursday morning with a backpack of prototypes and more games in my suitcase. And enough underwear and socks to make it till Saturday. This year I was flying solo--I've had a copilot nearly every other year. I planned to share a room with John Moller (of CarTrunk and UnPub fame), Darrell Louder (of Compounded fame) and Ian Rosenthaler (of Legend of the Lost Dutchman art fame). This worked out very well. Thursday I made the rounds, scheduled some meetings and played some Lucky Dice (score=20). 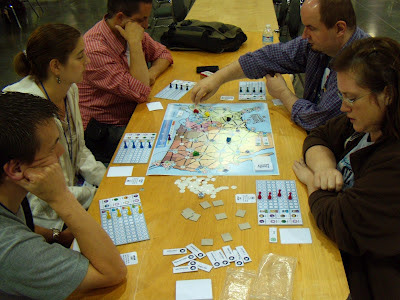 John already had the UnPub area going with Brian Lewis and his Titans of Industry. I didn't get to play, but I watched for a good while. Minion Games was a sponsor of the show and had lots of great posters everywhere. 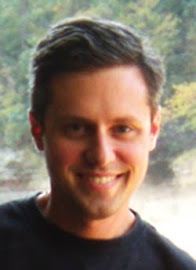 James Mathe did lots of demos in the Board Room (mostly Kingdom of Solomon and Manhattan Project--currently ranked 424!). As you might have heard, the crowd was a bit sparse that day. Here's Corey Young's now infamous picture of that sparseness (posted to BGGN). Traffic would increase over the next couple of days.